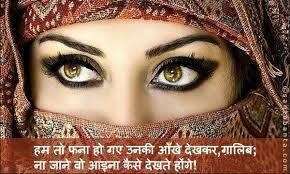 If you looking Romantic Shayari on Eyes in Hindi for WhatsApp and facebook then we have chosen best Shayari on Eyes in Hindi for you. We are hoping you will like for sure. As per our understanding, Shayari is the best way to describe your feeling to others.